1944 wasn’t a great year for most stock advisory newsletters. 7 out of 10 of their recommendations lost money… 8 out of 10 didn’t keep up with inflation… and 9 out of 10 couldn’t even earn a 10% return for their readers! But 1994 was a spectacular year for Vital Information’s Weekly Wealth Letter. 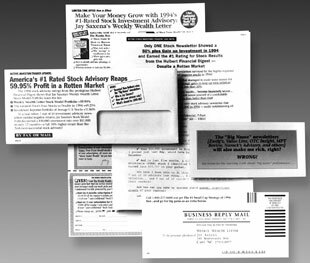 The Stock Model Portfolio for this little-know newsletter gained 59.95% in 1994, earning it the #1Rating for Stock Results from the prestigious Hulbert Financial Digest. Weekly Wealth Letter’s editor/publisher Jay Saxena wanted an effective way to market his outstanding record of stock recommendations and generate new subscriptions for his newsletter. A free “Stock Trader Wealth Kit” of special reports and books. The CDMG package hit pay-dirt…and Jay Saxena took it to the bank! Not only did Jay’s mailing soar through its break-even point, it generated 518 new subscribers and earned a profit of almost $30,000! Better yet, as any successful direct marketer will tell you, once you have a winner, you keep on investing in it. So Jay is planning another mailing! If your product or service isn’t generating the kind of enthusiastic response that Jay Saxena is enjoying, the solution to your problem might be as simple as a phone call to CDMG.